The extreme noise and crash danger of military jets makes basing them in densely populated areas unacceptable. The US Air Force does not pull punches: it readily admits the extreme harm it delivers to civilians in Vermont with its F-16 jets. It disclosed that the plan to replace F-16 jets with F-35s in 2019 will increase the number of civilians harmed, that the harms will be more severe, and that children and adults will be harmed in more ways. The Air Force divulged three distinct ways the F-35 will hit civilians with permanent hearing loss, as well as the extreme crash danger from the jets taking off from a civilian airport. Truthout has reported on the referendum and city council votes demonstrating public opposition to the jet basing. As Truthout has also reported, the Air Force admits that F-16 jets and their flight paths are so tightly intermingled with the schools and homes of thousands of Vermonters that their extreme noise impairs learning of 920 children who are directly blasted several thousand times a year as the F-16 jets take off. Learning is also impaired for thousands more who attend the seven schools that are hit with multiple daily classroom-speech interruptions. The Air Force also admits that the high average noise level its F-16 and F-35 jets produce can cause hearing damage for as many as 583 adults and children whose 242 homes are closest to the Burlington International Airport, and where the aircraft noise, when averaged over 24 hours, exceeds 75 decibels (dB). The intermingling of F-16s with civilians at the Burlington International Airport is extreme. The F-16 hangers are directly across the runway and only 600 yards from the civilian air terminal building, where some 3,400 civilian passengers daily depart or arrive aboard civilian flights. The runway is located amid the Chamberlin School neighborhood of 1,966 small, working-class homes. Four hundred and ninety-six children attend the Chamberlin School, located 880 yards from the runway. Air Force charts and maps report that 4,602 people live within the Air Force-determined “noise danger zone” that extends three-fourth of a mile from the runway. Hundreds of civilians work at the airport and at industrial and commercial facilities immediately adjacent to the airport. According to the US Census, 127,751 people live in seven Vermont cities and towns within four miles of the runway. In addition to those 583 people living within 600 yards of the runway where they are exposed to a hearing-damaging high average noise level, the Air Force also describes two other mechanisms of hearing loss, including one that takes only a single exposure: while at a lower noise level, repeated exposures will cause harm. The Air Force provides a chart stating that when the F-35 reaches 1,000 feet altitude after takeoff, it hits people on the ground below with a 115 dB noise blast that is more than four times louder than produced by the currently based F-16. This noise is even louder for people adjacent to the runway and exposed to the F-35 as it accelerates along the runway or before it reaches 1,000 feet. 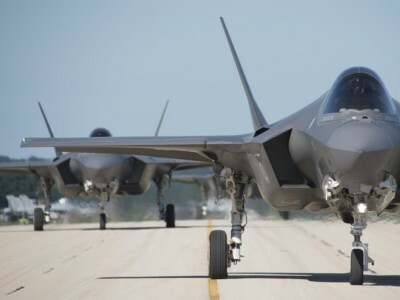 The Air Force also discloses how many times people will be hit with repeated exposures to this noise: The F-35s will take off from the Burlington airport 2,200 times a year, more than enough to cause permanent hearing damage. Several densely populated Vermont cities and towns adjacent to the runway or in its flight path will be hit with these thousands of repeated exposures at or above the hearing-damaging 114 dB noise level. An Air Force chart says the F-35 will take off with its ultra-loud afterburner blasting 5 percent of the time, or 110 times a year. Judging by F-16 history, this number of afterburner takeoffs may rise well above 5 percent and may approach 100 percent, as it has for the current F-16 takeoffs, Pierre Sprey, a co-designer of the F-16 concept for the Air Force, told Truthout. An Air Force chart says the F-35 is 21 dB louder than the F-16 when either takes off under ordinary military power without afterburner and reaches 1,000 feet elevation. The F-35 hits people below with 115 dB while the F-16 hits people below with 94 dB. An Air Force noise contour map shows that the F-16 taking off with afterburner blasting is even louder than the F-35 taking off under ordinary military power without afterburner. But the F-35 will be closer to some civilians than 1,000 feet as it accelerates down the runway and takes off, so its afterburner noise level could be even louder than 136 dB for those civilians. Permanent hearing damage will hit airport passengers; patrons of and workers at the Pizza Putt and the Skinny Pancake; residents of the Chamberlin School neighborhood; those just walking a dog, riding a bike or driving by on Airport Parkway; and children and teachers at the Chamberlin School. Noise from each of the F-35’s 110 afterburner-engaged takeoffs each year can produce the permanent hearing damage either immediately upon one exposure or it may take repeated exposures, depending on how close people and animals are to the runway. Hearing damage in children will compound the learning impairment from the direct blasting and classroom speech interruptions. While one F-35A stealth fighter was experiencing a nose gear collapse upon landing on the runway at Eglin Air Force Base, Florida, on August 22, 2018, another F-35A at the same base was hit with a bird strike. The first F-35A was returning to base after experiencing an unspecified in-flight emergency. Neither pilot was injured. On September 23, 2016, an F-35A taking off at Mountain Home Air Force Base in Idaho was engulfed in an uncontained engine fire on the runway caused by tailwinds present at engine start. The fire spread to aircraft surfaces, panels, cables and components. “The pilot escaped from the aircraft but sustained burns to his head, neck and face,” reported Defense News. On June 23, 2014, an Air Force F-35A suffered a catastrophic engine failure during takeoff at Eglin Air Force Base in Florida. The accident investigation report indicated that pieces of a fractured rotor cut through the engine’s fan case, engine bay, internal fuel tank, and hydraulic and fuel lines, igniting leaking fuel and burning the rear two-thirds of the aircraft. The pilot was able to bring the jet to a stop before the end of the runway and escape before “the flames quickly grew to an inferno,” reported War Is Boring. Until the decision to base F-35 jets at the civilian airport in the Chamberlin School neighborhood, Air Force policy has invariably been to keep such unproven fighter jets far away from civilians. For example, an Air Force chart shows the F-16 fleet had more than 1 million flight hours — and learning from dozens of crashes — before it was brought for basing in the Chamberlin School neighborhood in 1986. That is 10 times as many flight hours as the Air Force version of the F-35 is expected to have before it arrives for basing in that neighborhood in 2019. Thirty-five percent of the weight of the F-35A is a combustible military carbon composite material with a combustible stealth coating. Upon a crash, when the 10,000 pounds of combustible materials burn in the inferno of 2,700 gallons of jet fuel carried by the F-35, a Naval Air Warfare Center Weapons Division report states that highly toxic, mutagenic and carcinogenic fumes, particulates and fibers are released during the time before firefighters arrive. In view of the catastrophic consequences for perhaps thousands of people and animals breathing downwind of a flaming F-35A crash, an Air Force report suggests “anticipating and preventing” such an event. Taking into account the high crash rate expected by the Air Force for the still-immature F-35, “anticipating and preventing” a catastrophe requires keeping the F-35 far away from people. “Anticipating and preventing” is also inconsistent with basing the immature F-35 at a busy civilian airport and amidst families who live in Air Force-designated crash danger zones extending from both ends of the runway. In Vermont, 1,443 homes in the towns of Winooski, Colchester, Williston and Burlington are located in the Air Force designated “accident potential zones” extending nearly three miles from each end of the runway. Thirty-two South Burlington and Williston commercial or industrial properties are located in the “clear zones” immediately adjacent to ends of the runway. These are all zones where the Air Force says the danger of a military jet crash is especially high. In particular, the runway at the Burlington airport aims directly at the center of Winooski, a densely populated city with more than 7,000 people only one mile from the end of the runway. The extreme noise and crash danger of the F-35 admitted by the Air Force makes it unacceptable to base in a densely populated area like the Chamberlin School neighborhood. Political and military leaders responsible must be held accountable. The mayor of wants to overrule the people’s health concerns.